The use of an oblique moulder allows the sheeting and the moulding of the dough into a baguette, big or small long loaves. 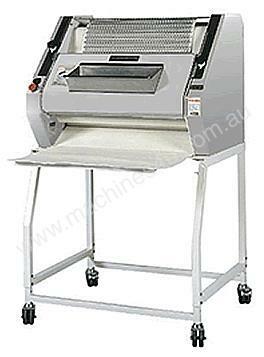 The Pavailler Euro 2000S machine replaces manual moulding, in order to gain time. The frame is composed of 2 stainless steel sides linked, and one for the front, by metallic braces The left side houses the kinematics of movements, the right side contains the setting mechanism of the different functions. Each side is covered by a stainless steel jacket. The sheeting unit consists of 2 plastic cylinders (food safe), fixed on tight ball bearings and of a 3rd cylinder enabling the approach of the dough piece. The scrapers (food use) are easily removable, they permanently clean the cylinders. Dough pieces easily enter through a centralising spout. This spout protects the operator with a safety device that disables the moulder if the protection spout is not installed. A heavy belt, (metallic bars leaning on felt) assures the rolling of the dough piece to make the moulding easier. The moulder consists of 2 different cases bearing the cylinders and the belts The belts are made of synthetic felt (food use) and turn in opposite directions.